- تو ملا نے جواب دیا "تم کو اس کنارے پر آنے کے لیے اُس کنارے پر رہنا ہوگا ! " 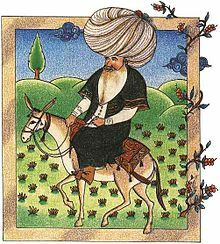 ^ ا ب پ The outrageous Wisdom of Nasruddin, Mullah Nasruddin; accessed February 19, 2007. ^ ا ب Mulla Nasruddin Stories, accessed February 20, 2007. ↑ Ohebsion, Rodney (2004) A Collection of Wisdom, Immediex Publishing, ISBN 1-932968-19-9.